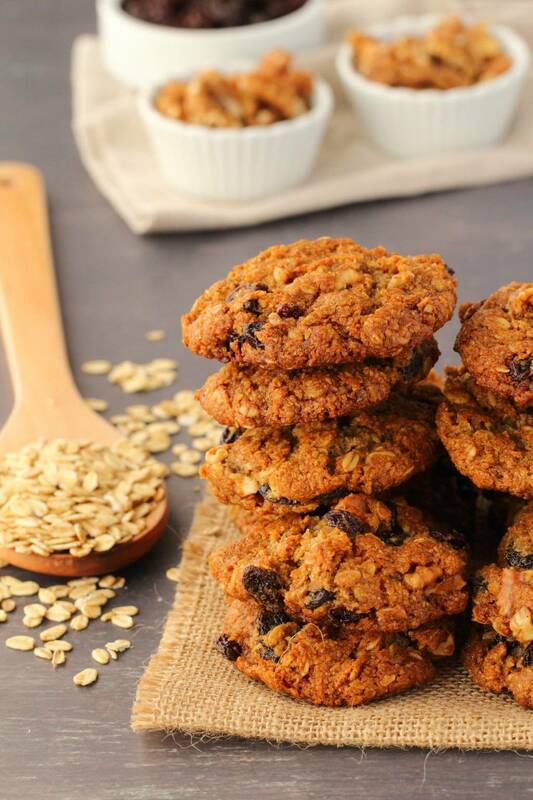 There is always time for another vegan oatmeal cookie recipe. 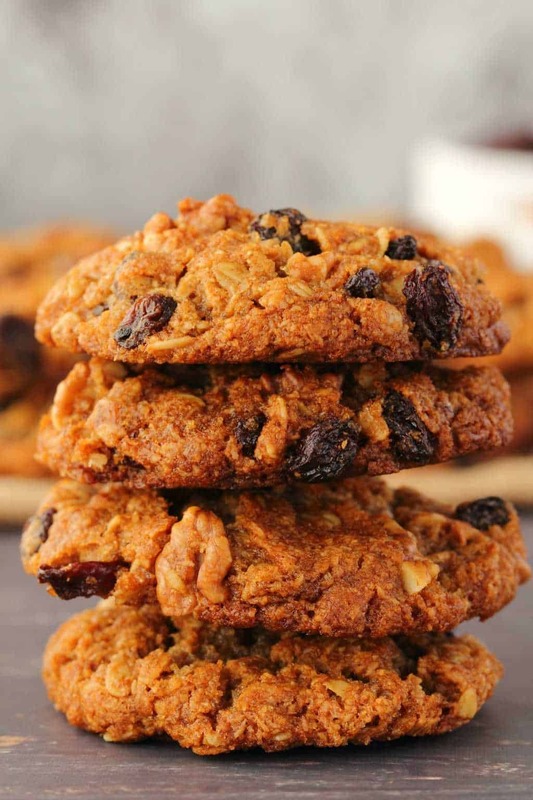 These vegan oatmeal raisin cookies are so good, you’ll love them even if you don’t love raisins. Seriously. I’m not a massive fan of raisins, in that you won’t generally find me eating a handful of raisins ever, but I’ll eat them when they come mixed up with salted peanuts or when they’re in a dessert (like this vegan chocolate tiffin, then they’re awesome!). 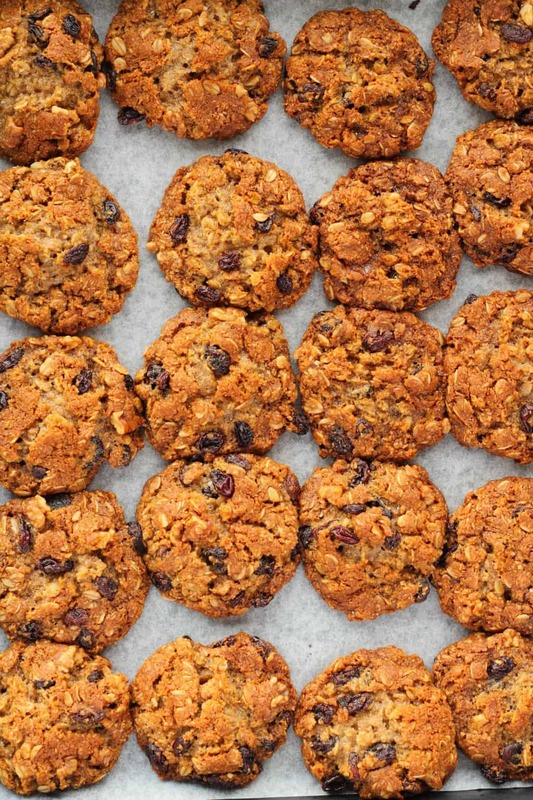 And in these cookies, they are so good and mix in so well with the other flavors, it will pretty much make a raisin convert out of anyone. They are just ultimately good. 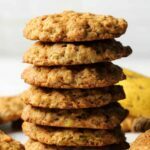 We’ve already done a bunch of oatmeal cookie recipes on this blog but there is always space for more. 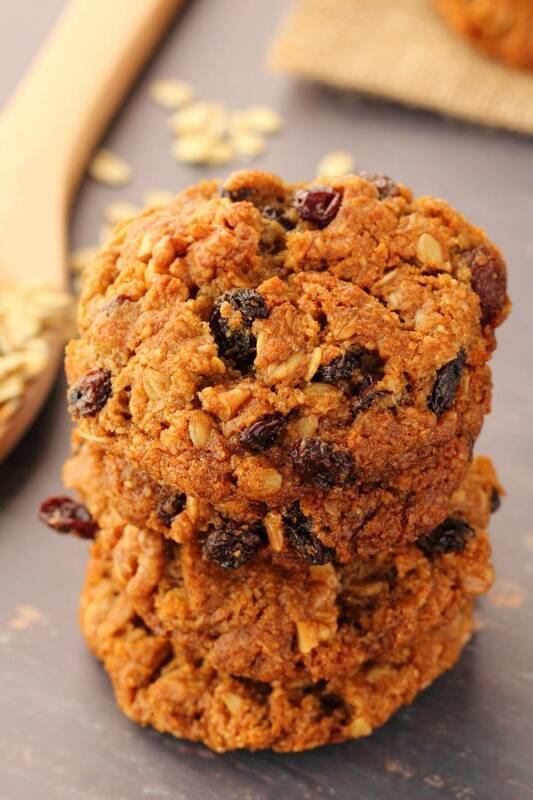 Have you tried our simple vegan oatmeal cookies, vegan oatmeal chocolate chip cookies or vegan peanut butter oatmeal cookies yet? If you have, then you know how good they are and how good this one is going to be too! When I first tested these cookies, I could only find jumbo raisins in the store, and those did not work out well at all. They are just too big to go easily into the batter and even when the cookies were baking, it was like these giant raisins were just falling out of the cookies onto the baking tray! So don’t use jumbo raisins! You want the nice and small and seedless variety. 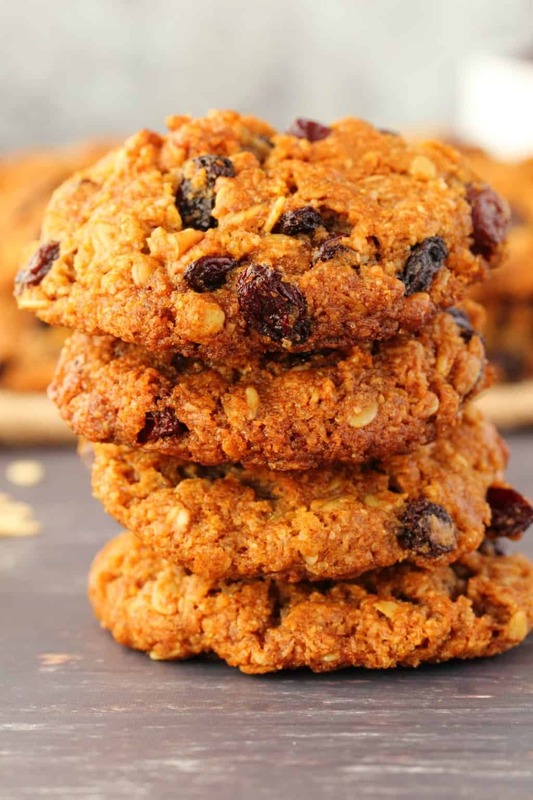 What sets these oatmeal cookies apart from other oatmeal cookie recipes is well, raisins of course, but also the addition of molasses. 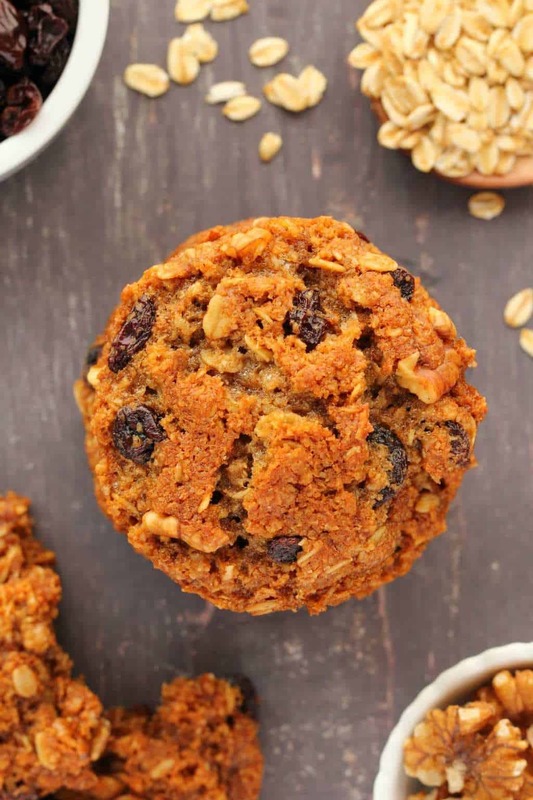 You just use a small amount but nonetheless you will notice the difference in flavor, and that blends so well with the cinnamon and brown sugar, and raisins of course. We also add in some chopped walnuts, which I was a bit sceptical about at first, but works so so well with these. But if you don’t eat nuts, don’t worry you can omit them. They’re an optional add in but oh so good! 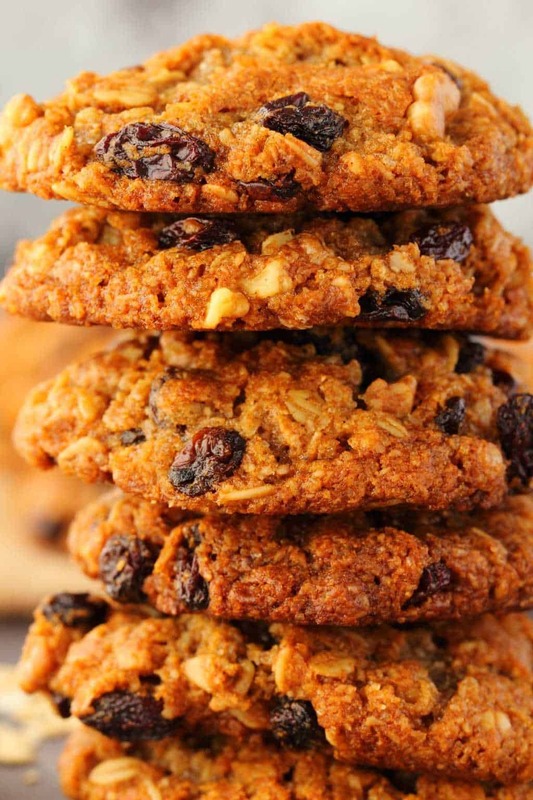 These vegan oatmeal raisin cookies are super quick and easy. They take 30 minutes from start to finish. There’s no chilling of the dough or any delays in this recipe. 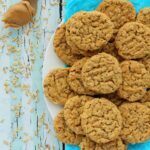 If you have a serious oatmeal cookie craving and have the ingredients on hand then in 30 minutes time you could have a batch of freshly baked cookies coming out of the oven! You’ll have to wait for them to cool down, but you’ll be enjoying some of this cookie goodness in a very short amount of time. When they come out of the oven, the cookies are quite soft in the middle. You might even wonder if they’re cooked. As long as they’re nicely browned on top, they’re good. Let them cool directly on the tray and they’ll firm up beautifully. 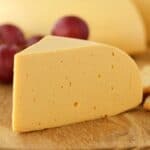 Keep them stored in an airtight container at room temperature and they’ll stay good for up to a week. 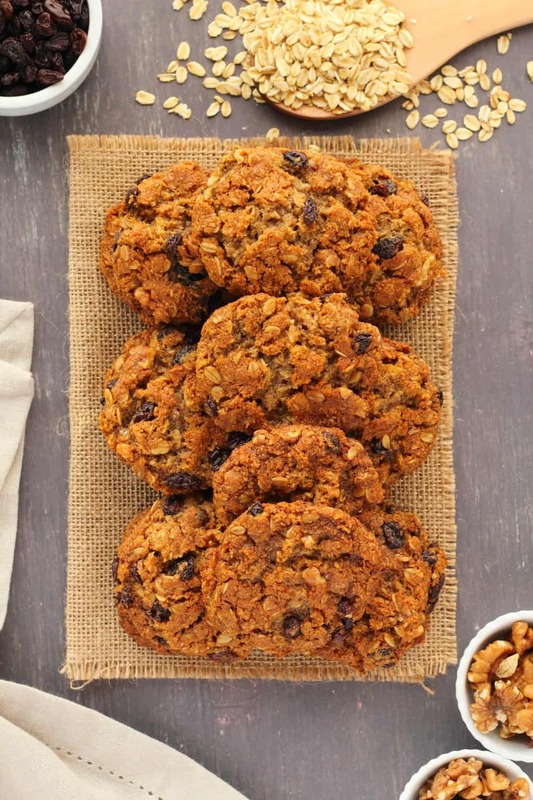 What do you think of these vegan oatmeal raisin cookies? Going to make them soon? I hope so! Let me know in the comments! And please rate the recipe too, it’s so helpful, thank you. Sign up to our email list while you’re here, you’ll receive an awesome 10-recipe dinner recipes ebook (entirely free) and you’ll be the first to know when new recipes are posted to the blog. 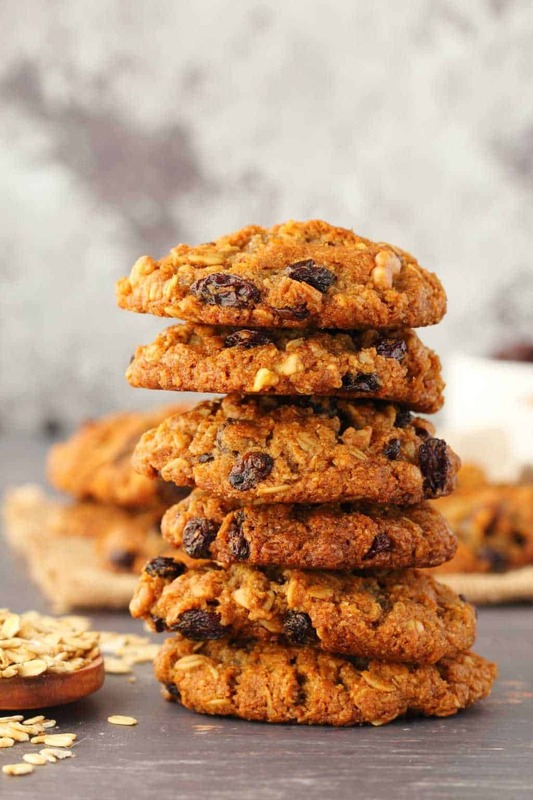 Vegan oatmeal raisin cookies that are crisp on the outside, soft and chewy on the inside, super moist and rich in flavor with a hint of molasses. Super easy recipe. 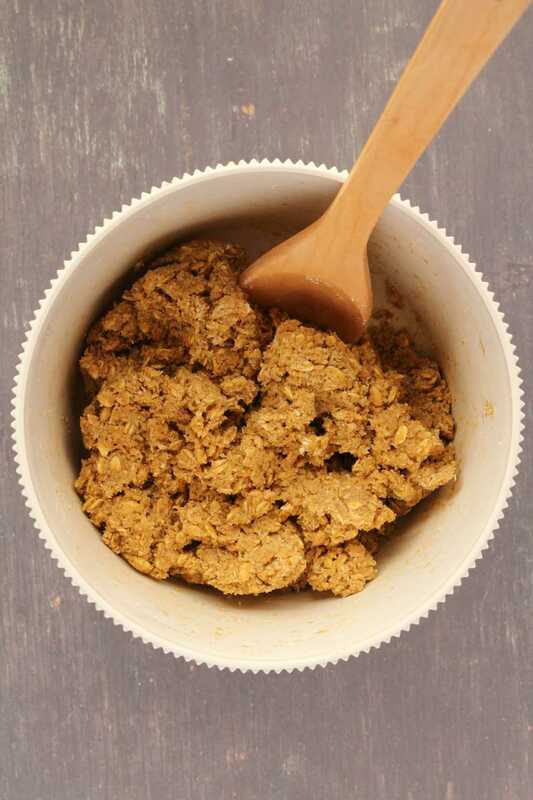 Add the vegan butter and brown sugar to the bowl of an electric mixer and cream them together. Add in the golden syrup, molasses and vanilla and mix in. 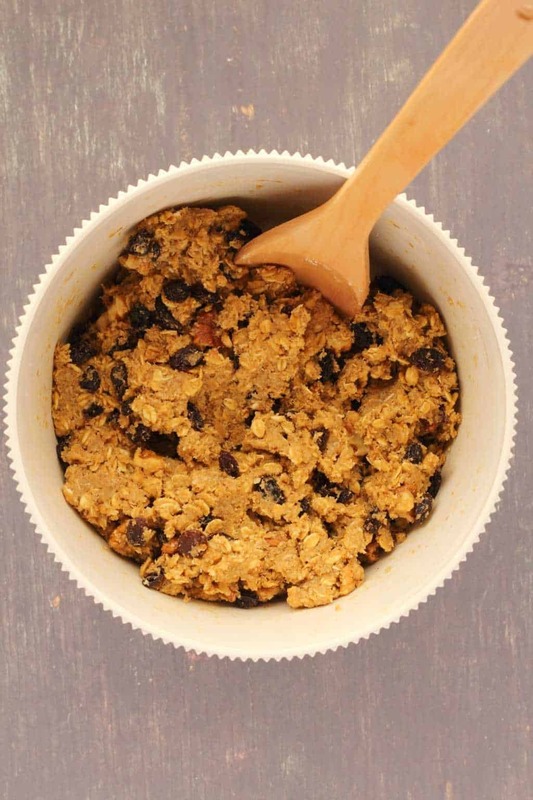 Add the rolled oats, all purpose flour, dessicated coconut, baking soda, salt and cinnamon to a mixing bowl and mix together. Add the dry ingredients in with the wet and mix in (by hand, don’t use the electric mixer for this part) until crumbly. Add in the soy milk and mix again. Your dough should be very thick, but you should be able to roll it into a ball and have it stick together perfectly at this stage. 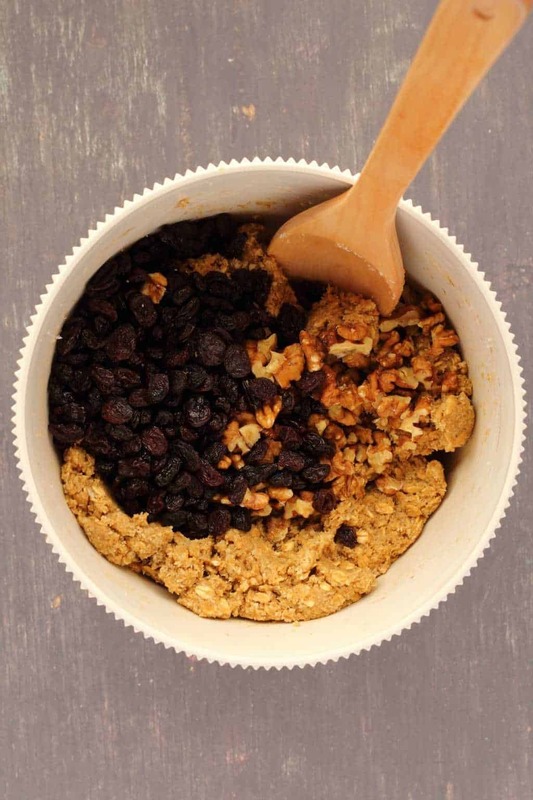 Add in the raisins and chopped walnuts and mix in. Preheat the oven to 350°F (180°C) and line a baking tray with parchment paper. Roll the dough into balls and place onto the parchment lined baking tray. Aim to get around 20 cookies. 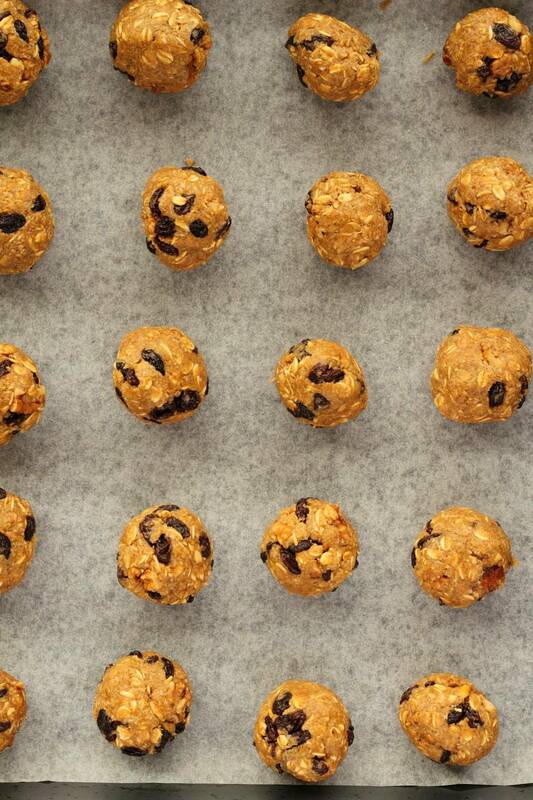 Try to ensure the raisins are spread out in the cookie dough so that you don’t end up with some cookies having no raisins and some cookies having a lot of raisins. The tops will be golden brown and the edges firm but the cookies will be very soft in the middle. Allow the cookies to cool on the baking tray and firm up before moving them. *You can substitute any syrup for the golden syrup if you don’t have any golden syrup around, I just like golden syrup as it has a very nice caramel flavor. 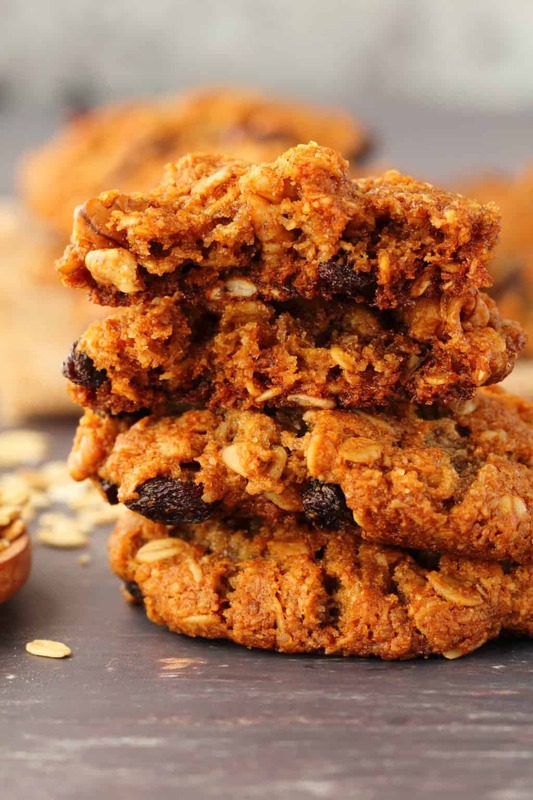 *You can omit the walnuts if you prefer a nut-free cookie. I substituted vegan butter for coconut oil and brown sugar for coconut sugar. They turned out really nice, but I only needed to bake for 10 minutes. I just took my last tray of these cookies out of the oven and they smell heavenly!! Then I tried one!!! Sooooo yummy crispy on the outside and chewy in the middle!!!! Awesome, awesome cookie! I made mine with GF flour and instead of raisins I put in dried cranberries. I didn’t have coconut so I just added more oats and my husband will even love these!!!!! Thank you for a great recipe! Very crunchy on the outside but soft and chewy on the inside!! 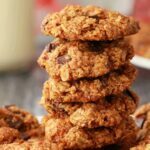 This is the best vegan oatmeal raisin cookies I have tried! Even when I replaced sugar by coconut sugar, way too sweet. A quarter of the sugar would be plenty. Coconut sugar has the same level of sweetness as regular sugar, and the same sugar content per gram, so I’m not at all surprised it was equally sweet. If you don’t like your cookies to be sweet you can definitely use less sugar but I would not consider your tastes to be universal. I don’t think they are too sweet. Simply the best cookie recipe. It doesn’t get better than this. Addictive! Very good if you are looking for something very sweet – and what cookie isn’t! I tried both a wheat flour version with raisins and walnuts and a gluten free version with cranberries and pecans. Excellent results with both. For a less sweet treat, I don’t think simply reducing the sugar would be successful because it’s what holds the cookie together…. I did wonder about the tablespoon of vanilla though…should that be a teaspoon in the recipe? Thanks! Hello! 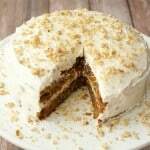 I’d like to make these, but I’m wondering if you have a suggestion for something to replace the coconut as I’m not a fan of it! Thanks! So excited to try these! These were great! 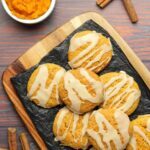 I used coconut oil instead of butter and used 3/4 sugar since I prefer my cookies a little less sweet, but over all great recipe! They were the good kind of dense and chewy. Perfectly hit my craving! Thanks for the easy recipe! Oh, and I put cut up crystallized ginger in half, just to try it out, and it went really well! 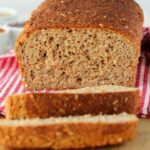 Is there another substitute for the coconut powder? These were awesome! I made a few changes and additions (threw in dark chocolate chips and Cinnamon Toast Crunch cereal, skipped the coconut and swapped cashew milk for soy milk, of which I added slightly more), but the cookies still turned out great. They’re definitely very sweet, even without the additions, but the flavour is great, and they very effectively resolved my sweet tooth. 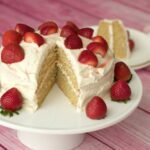 Hi, am going to try this recipe, but would like to know if I can use coconut flour instead of dessicated coconut. these were amazing and my very anti-vegan grandma even asked for the recipe! I subbed walnuts for almond flakes and used date syrup instead of the maple syrup and they were so bloody gorgeous! Recipe saved and bringing these bad boys out more often! I love the cookies but mine are not spreading out. The dough is moist, but not moist that it will hold perfectly. Also I’ve use a 3tbsp cookie scooper. Do you think making them smaller & adding milk will help them flatten out? Hi Tae, usually if they are not spreading it’s because the cookie dough is too cold when the cookies go into the oven. You can try creaming your vegan butter and sugar for longer, or you can also just flatten your cookies with a fork before they go into the oven if you are running into this issue. 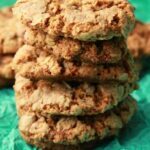 Another home run cookie recipe from this website. 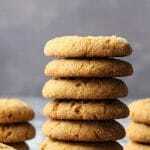 This is a really old school cookie recipe with the molasses in the batter. The results are incredible. Made them for my family and everyone has since made them on their own. Delish! Delicious! Might do sliiiightly less raisins next time, but seriously not too sweet! I just did almost 2 tbs of maple syrup instead of molasses, but I can imagine what that would add! These cookies were absolutely perfect. 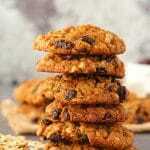 Had the taste and texture of classic oatmeal raisin cookies! 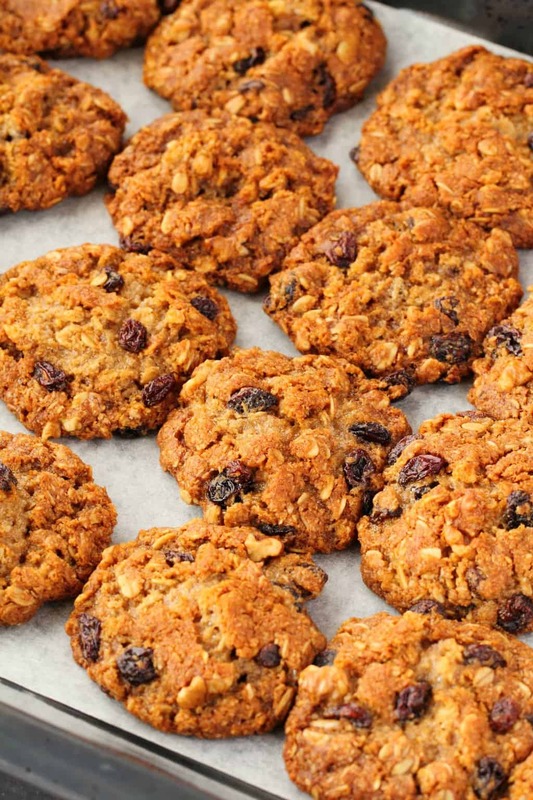 Sweet, oat-y, a little spicy, and full of plumped up raisins. I omitted the walnuts this time, and used date syrup instead of molasses as unfortunately it isn’t sold where I live, but that didn’t seem to make a difference. Thank you so much for this fabulous recipe, I’m saving it forever!